Pet Friendly 2BR/1BA Duplex Only 2 Blocks from the Beach! SANDY is a bright and beachy 2 Bedroom (sleeps 6)/1 Bath upstairs cottage with all the amenities of home, including a K-cup coffee maker, cable TV and wi-fi, king-size master bed, a 50” tv in the den with tv’s in each bedroom, full-size washer and dryer, reclining den seating, and a picnic table with a park-style grill downstairs. Relax on the sun-drenched deck surrounded by palm trees and breathe in the salt air with 2 separate dining areas and a chaise lounge. Walk 2 blocks to the beach and nearby seafood restaurants, Waffle House, Island Grill, Dollar General, moped and bike rentals, and gift shops. Walmart, Walgreens and Rouse’s Grocery Market are just down the street and around the corner, too. The Gulf State Park Fishing Pier and upscale restaurants are a few blocks away via sidewalk or a short drive.. along with the Gulf State Park dog park, nature trails, bike paths and segway rides. Ziplines, charter fishing, dolphin watching, and jetski rentals are also available nearby. You are in the heart of East Beach with many locals in this neighborhood “livin” the dream. 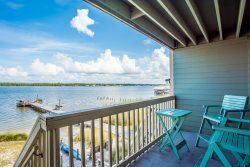 Close to the beach, the sand, the Gulf, and everything it takes to “get away.” You are in the most accessible and convenient part of the island here at Sandy. The most affordable accommodations you'll find in this part of Gulf Shores. Our downstairs unit (Salty) is also a 2 bedroom, 1 bath with its own unique beach decor. It's a separate listing, so please email the manager for rates to book both. This listing is for the upper unit only. PET AGREEMENT MUST BE SIGNED. Quote does not include pet fee. SUPPLIES: Starter supplies of toilet paper, paper towels, dishwasher detergent, and soap laundry is provided. The space had everything we needed and more. It is a quiet location close to everything. We had a short walk to the beach or the market. It was a great choice for a relaxing weekend getaway. I would recommend highly for small families or those traveling with pets. The location was great, the surrounding neighbors were very friendly, the space had everything we needed. We had a wonderful experience. Thank you! We had a great time the house was a perfect match for us and our dogs. The house was a beautiful gem. The house was exactly as described and in close proximity to the water. The house was well stocked with kitchen accessories, games, and outdoor furniture. All you really needed to bring were beach towels and a cooler. We enjoyed ourselves very much. Keith was a great host. Great location to the beach and restaurants - just a 5-minute walk to beach access. Mostly everything you need is there already, but we did need to go and buy toilet paper and other similar items the second day we were there which we did not expect to need to do. The couch cushions are not completely attached, and we were constantly rearranging them. We were able to check in early when housekeeping was finishing up which we appreciated. All in all, a good stay and we would come back. Keith was very accomodating and his place was just like in the pictures . Everything we needed. It was clean and we did not have any problems while staying here. It's super close to the ocean and to many stores. Would definitely stay here again. Loved our time here. Thanks! Keith was a great host. We had everything we needed at the house, and more! The house was full of charm and had a great beach feel, the balcony was great next the palm trees, and we really enjoyed our stay!